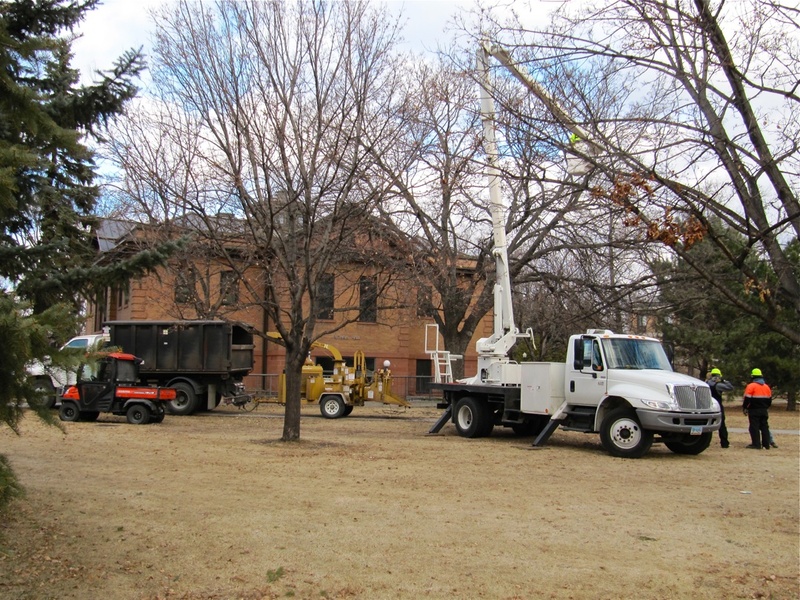 Wood chipper outside of the south side of Putnam Hall, North Dakota State University, Fargo, on December 7, 2011. I suppose it is only fitting that necessary tree trimming and — more important to Fargo — full-throttle wood chipping goes on just outside of where speaker phone conferences and meetings are taking place. Yes, a large yellow wood chipper (center photo) is approximately 5-to-7 meters south of the second floor windows, this glass providing the buffer between the necessary forestry work and our nice little conference. Thanks for making that afternoon funny (both funny “ha-ha” and funny “peculiar”), Coen Brothers. This is what the original Fargo wood chipper looks like. The one at left in the photo is a more intense model. This entry was posted on Wednesday, December 7th, 2011 at 9:59 pm	and posted in Uncategorized. You can follow any responses to this entry through the RSS 2.0 feed.